Here's a small section after a single match was tossed in the center. The fire grows outward in all directions like a fungi growing through the soil. When it hits the gridline, it stops because the fire triangle of heat, oxygen, and fuel is missing a piece. It is elegant in it's simplicity. I had spent some time in Karate class so the take down and control training seemed familiar. What impressed me was the kubotan (or a ballpoint pen) applied to select pressure points. I remember a petite trainer who put me down and at her mercy with a ballpoint pen applied to my wrist. Ouch! So glad that you are taking care of your land. 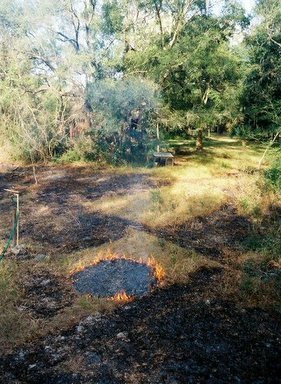 Burns are part of Florida's natural cycle like you said but too often even the profesionals let the control burns get out of hand. You have a well thought out plan. Thanks for your care of Florida.